American Dreams in China storms the box office: The Chinese version of The Social Network is insanely nationalistic. You Know What’s Cool? A BILLION Yuan. The Chinese answer to The Social Network is a massive, pro-copyright infringement smash. 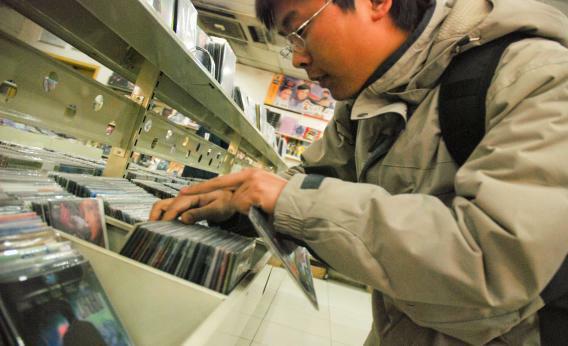 A Chinese man browses pirated DVDs at a shop in Beijing on Jan. 2, 2010. Why would anyone pay to watch a movie in China? I traveled to the country this month, visiting a friend who’d spent two years learning Mandarin and commuting by heavy bike, and stumbled onto the bootleg market without even trying. Walk down any mildly busy street and there they are, the plastic-wrapped, legit-looking DVDs and Blu-rays of movies that came out in the States two days ago. But my friend wanted to show off an actual Chinese theater, so it was in the bellows of a marbled nine-story Nanjing luxury mall that we paid up for American Dreams in China. It was the most popular movie in the country, not just in rip-off form—No. 1 at the actual box office, opening to $51 million. We walked in past cheerful cinemagoers taking selfies in front of the poster art, with Huang Xiaoming, Tong Dawei, and Deng Chao smiling down at them. People had been calling this movie “the Chinese Social Network.” Good call, people. American Dreams in China neatly follows the Aaron Sorkin script, telling the story of three friends who launch an online English instruction school for Chinese students, starting with their day in copyright court. “You’re a thief,” snarls the toothsome, smug American who’s suing them. He claims they ripped off his technology and coursework to start their company, New Dream. They admit that they did. New Dream is a movie fiction; the company actually depicted in the film went by the less title-friendly name of New Oriental Education & Technology Group. (Oriental Dreams in America sounds like a PBS slog your TiVo would record by accident.) Peter Chen’s film came to him as a tribute to the company, and one of the real-life founder-nerds drafted the first screenplay. Chen asserted his artistic independence, and the company treated the movie … actually, sort of like Mark Zuckerberg treated The Social Network. The result of this tussle is an oddly fascinating tribute to the three C’s: capitalism, China, and copyright theft. Not since Frank Capra’s Bailey Building and Loan Association has a business been presented so warmly on screen as New Dream is here. Cheng (Huang), Wang (Deng), and Meng (Tong) meet in the first week of college classes, each of them armed with a special nerd skill. Cheng has a photographic memory, Wang is slobbily charismatic, and Meng has a confidence that edges into arrogance. (He gets a classic “walking out of class because he’s smarter than the teacher” scene.) All three apply for student visas. Meng actually gets out, bellowing “USA, here I come!” and fantasizing about being on magazine covers. This is how the film introduces us to Americans, the schmucks. We treat Meng like dirt, kicking him out of a lab job when someone comes along with a superior degree. He takes a job at a bar and gets shortchanged for tips. It’s not that Americans are particularly evil. They’re just overhyped. Back in China, Wang gets an American girlfriend who paws his “hot Chinese body” and seems impressed by every word of his pidgin. “Chinese people love America!” he says. “In Chinese, America is ‘the beautiful country.’ In Japanese, it’s the ‘rice country.’ ” She buys it and beds him. Come on, how smart can these people be? Cheng’s salvation plan is a little ironic—he stays behind, quits his job at a regimented English-teaching school, and starts his own classes based on what we in 2013 would call “real talk.” He can’t get to the States, but he’s memorized English words and courses to help out the desperate. From a small gathering in a KFC it grows into an unofficial school, based in an abandoned factory. One night, when the power goes out, the ambitious students switch on flashlights. Cheng et al have mastered English, and when Meng returns, he infuses the classes with cynicism about what Americans really want to hear from the Chinese. The Americans babble about Yao Ming; Cheng and Meng say this just proves that the Chinese are winning. “China is already the world’s largest market for English-language education,” says Cheng. “Today Chinese students don’t aspire to stay in America. They want to go home—yet you’re still stuck on whether they cheat on exams!” They settle, they announce the public offer, and they climb into a cab bragging about having the Americans “by the balls.” On the way home they stop by the lab that fired Meng—they’ve bought it and named it after him. Between all of this and the dance remix of “L’Internationale” that starts the movie, I thought I’d gotten the point, but Chen wasn’t done. The Social Network ended with a squib about Facebook’s future valuation. American Dreams in China ends with an inspiring montage of countrymen who studied in the States then came home to conquer, people like Alibaba’s Jack Ma and Google’s Kai-Fu Lee. I traveled for a week after the credits rolled, and occasionally I’d find a Chinese movie-lover who’d seen Dreams. Nobody copped to really loving it. The first half of the movie was slapsticky and witty; that, not the patriotic showdown, was what they took away.